Meet the rodents of the world in this illustrated guide to 21 species of rascally creatures! What is the smallest rodent in the world? What is the biggest? How long can rodents live? How do they find mates? Find out all this and more in this wonderfully detailed new book from award-winning author-illustrator Roxie Munro. With bright, life-sized illustrations and simple text describing the life cycles, habitats, and ranges of these fascinating creatures, Rodent Rascals is packed with fun facts about these often overlooked or maligned creatures. From the pygmy jerboa to the capybara, there's a whole world of clever creatures to discover! Backmatter includes expanded information on all the species featured, a glossary of important vocabulary introduced in the text, a list of further reading, and an index. 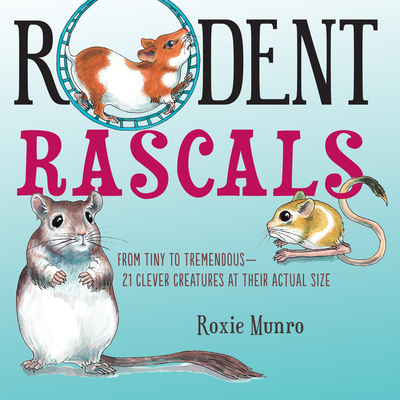 Roxie Munro has written and illustrated more than 40 books for children, including Rodent Rascals, which received three starred reviews, and Market Maze. Munro speaks widely at educational conferences on the topic of learning and gamification. She is also the creator of several award-winning apps for children. She lives in New York, NY.